Glycosylation is one of the most common forms of post-translational modification of eukaryotic proteins. Glycosylated proteins (glycoproteins) make up the majority of human proteins. The polysaccharide side chains (Glycans) play critical roles in physiological and pathological reactions ranging from immunity to cell signaling, development and death. Besides the interest of researchers in characterizing gylcosylation pattern of glycoproteins for structure/function analysis, the thorough characterization of glycosylation is a major quality parameter in the production of biotherapeutics. Hydrophilic interaction chromatography (HILIC) is a well-recognized technique that effectively separates and quantifies isolated glycans. HILIC is used primarily for the separation of polar and hydrophilic compounds. It is commonly believed that in HILIC the aqueous content of the mobile phase creates a water rich layer on the surface of the stationary phase based. This allows for partitioning of solutes between the more organic mobile phase and the aqueous layer. Hydrogen bonding and dipole-dipole interactions are supposed to be the dominating retention mechanisms in HILIC mode (Figure 1). Glycoprotein analysis involves characterizing complex N- and O-linked structures composed of frequently similar and repeating sugar moieties. Several complementary analytical techniques are routinely used to characterize, identify, and quantify oligosaccharides isolated from glycoproteins. 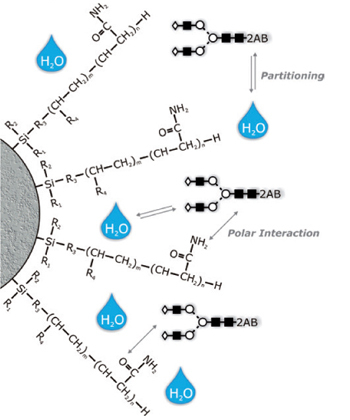 Besides mass spectrometric techniques, HILIC using amide-based stationary phases is a wellestablished, robust technique used by many laboratories to obtain high-resolution separation of N-linked glycans released from glycoproteins. Tagging the glycans with a fluorescent label such as 2-aminobenzamide (2-AB) allows the sugars to be detected at femtomole levels. HILIC can separate structures with the same composition (isobaric glycoforms like 2,3- or 2,6-sialic acid) on the basis of both sequence and linkage. (1,2). TSKgel Amide-80 column chemistry is ideally suited for the separation of charged and neutral fractions of glycan pools in one run. The retention of fluorescence labelled (2-aminobenzamide, 2-AB) polysaccharides by TSKgel Amide-80 enables the identification of glycan structures by comparison to a labeled dextran ladder. The dextrane ladder is used to normalize retention times in order to calculate the number of glucose units (GU values) of the separated glycans. The GU values obtained after separation of sequential exoglygosidase digests can be used to predict the glycan structure by database query (Glycobase, autoGU). Zona pellucida (ZP) is a glycoprotein matrix surrounding the plasma membrane of oocytes. Many eukaryotic extracellular proteins share a conserved sequence of 260 amino acids, called the ZP domain, which is an integral part of the ZP. 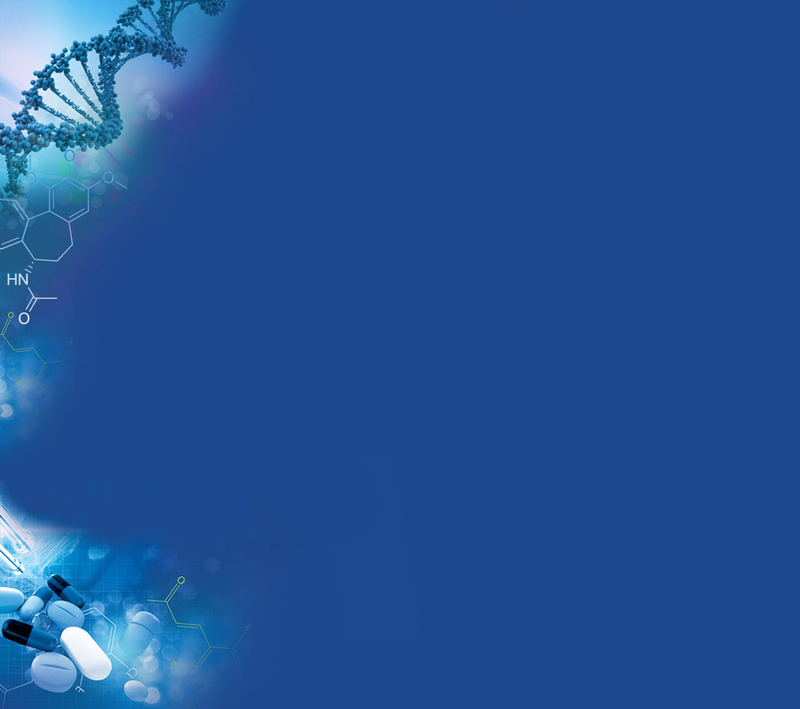 The transforming growth factor beta (TGF-ß) signaling pathway is involved in many cellular processes including cell growth, cell differentiation, apoptosis, cellular homeostasis and other cellular functions. The cytokines of the TGF-ß family exist in different subtypes (TGF-ß1, TGF-ß2, TGF-ß3). The TGF-ß type 3 receptor (TGFR-3) shows a high affinity to these three subtypes of TGF-ß and other proteins of the TGF-ß super family. Compared to the wide range of cellular processes which are regulated by the TGF signaling pathway, the function of TGFR-3 ZP domain glycans is not fully determined yet. In order to achieve a better understanding of transduction pathways especially for fibrosis or neuro degenerative diseases the role of TGFR-3 ZP glycosylation has to be determined . The application of HILIC for the characterization of a complex glycan structure is demonstrated using the example of N-glyco mapping of the ZP-domain of murine transforming growth factor beta type 3 receptor (TGFR-3). Figure 2 shows the protein construct of the ZP domain of murine TGFR-3 expressed in HEK293EBNA cells which was used for determination of the N- and O-glycosylation of the TGF receptor. Recombinant proteins were purified and submitted to endoglycosidase cleavage. Glycans were fluorescent labeled with 2-aminobenzamid and separated by HILIC. Figure 3 shows the fluorescence chromatograms of HILIC separations of 2-AB labeled N-glycans released from the recombinant ZP domain construct of murine TGFR-3, compared to the dextran ladder. The structure analysis was completed by high resolution mass spectra acquired on a MALDI QIT ToF MS instrument (Figure 4) (4). Dextran ladder (A), PNGaseF digest (B), sequential exoglycosidase digests (C-F). Used exoglycosidases: Sialidase A (Abs), α-Fucosidase (Bkf), ß-Galactosidase (Btg), ß-N-Acetylhexoamidase (Guh). Exoglycosidase sequencing in combination with HILIC separation on TSKgel Amide-80 and mass spectrometric analysis enables the determination of different N-glycan structures. 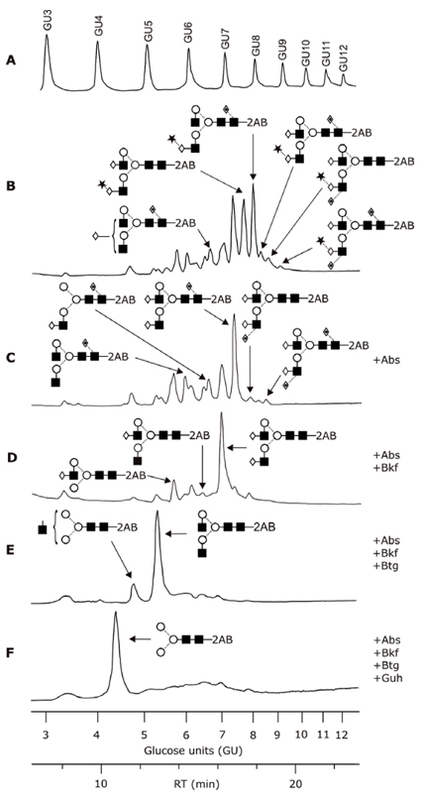 Isobaric glycoforms have been identified by retention time (Glycobase) and MS/MS experiments.